It’s time for some more inexpensive kitchen quick tips! If you use vanilla beans and don’t know what to do with the left over pods (or the old ones hiding in the cabinet) you have a few options. If you’ve used the pods for flavor (creme brûlée is a good example) you have to rinse them first then the fun can begin. Simple vanilla sugar is the easiest, just place the pods in your sugar bowl and voila. It’s also super simple to make vanilla extract. 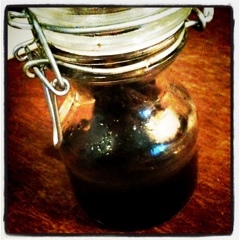 Chop up leftover vanilla beans and put then in a small jar (4 to 6 Oz is perfect). Fill the jar with a good quality vodka and seal it. Let the beans steep for a week in a cool dark place. Any time you have extra vanilla throw it in the jar and top off the vodka. If you increase the amount of vodka to about a pint and throw in your vanilla you can let it steep to get some great vanilla vodka. This entry was posted on June 28, 2011, 4:15 pm and is filed under cheat, Ideas, Recipes, Spirits. You can follow any responses to this entry through RSS 2.0. You can leave a response, or trackback from your own site.